group, as a Protestant evangelical Christian I had up to then given very little thought to the Shroud of Turin, assuming it to be just another fake relic of medieval Churchianity. However, in January 2005, I bought secondhand a book, "Verdict on the Shroud: Evidence for the Death and Resurrection of Jesus Christ" (1981), co-authored by a Protestant philosopher/theologian Gary Habermas whose judgment I trusted from having read some of his writings. Bogus: Shroud of Turin, The Conservative Voice, April 08, 2007, Grant Swank ... Why don't people go to the original source? When it comes to the Shroud of Turin, the source for finding out this and that about the fabric is the Bible. After all, the focus is on the cloth used to wrap Jesus' corpse. So it would seem appropriate to go to the Bible detail first for that kind of matter. When investigating the prime data in the Bible, one then realizes how much time and energy could have been saved. How many articles in magazines - even professional journals - have been written about the Shroud of Turin? How many scientists have performed experiments on it? How many theologians have given their opinions about first century specifics, authenticity of the cloth, and on and on? I am not sure who this "Grant Swank" is since there appears to be several Christian commentators by that, or a similar, name. But whoever he is, he clearly is commentating on something he knows very little about. Does he seriously imagine that no one has ever thought of, "When it comes to the Shroud of Turin ... go[ing] to the Bible detail first"? In fact among my many books on the Shroud of Turin, I have some which do consider whether it is consistent with the New Testament data (and it is). For example, Stevenson and Habermas's book, "Verdict on the Shroud" (1981) that I mentioned above, has an entire chapter four entitled, "The New Testament and the Shroud." And in a later book, "The Shroud and the Controversy" (1990), the same authors have a chapter 10, "Questions People Ask" and an Appendix D, "Biblical Questions Addressed," which both cover "the Bible detail" regarding the graveclothes of Christ. And Ian Wilson's classic, "The Turin Shroud" (1978), which anyone who claims to be a serious critic of the Shroud must have read, also has an entire chapter five, "The Shroud and the Recorded Burial of Jesus" by which he means, recorded in the New Testament. 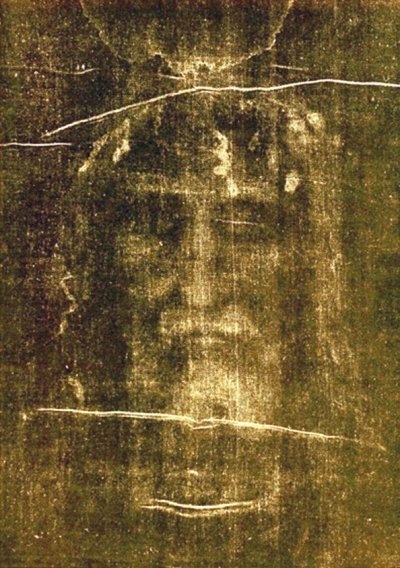 The Shroud of Turin is not the cloth that wrapped the cold body of Jesus. It may have belonged to someone else, but not Jesus. The Bible precludes that conclusion. Turn to the Gospel of John, chapter 20, verses 4 through 7: "They both ran, but the other disciple outran Peter and reached the tomb first; and stooping to look in, he saw the linen cloths lying there, but he did not go in. Then Simon Peter came, following him, and went into the tomb; he saw the linen cloths lying, and the napkin, which had been on his head, not lying with the linen cloths but rolled up in a place by itself." (Revised Standard Version). There you have it. The fabric used to wrap Jesus' corpse was of two parts, not one full piece. The Shroud is of one full piece. It can't be the wrap-around for Jesus' dead body. Twice the word "cloths" is used - plural cloths, not one cloth. Then the reader is informed that a separate "napkin" was used to encase Jesus' head upon burial. On the first day of the week, early dawn, the napkin was found separate from the other fabric. It is hard to believe someone could write something so obviously fallacious! No one claims that the Shroud was the only graveclothes of Jesus. Mt 27:57-60 "As evening approached, there came a rich man from Arimathea, named Joseph, who had himself become a disciple of Jesus. Going to Pilate, he asked for Jesus' body, and Pilate ordered that it be given to him. Joseph took the body, wrapped it in a clean linen cloth [Gk. sindoni = "linen cloth"], and placed it in his own new tomb that he had cut out of the rock. He rolled a big stone in front of the entrance to the tomb and went away." Mk 15:43-46 "Joseph of Arimathea, a prominent member of the Council, who was himself waiting for the kingdom of God, went boldly to Pilate and asked for Jesus' body. Pilate was surprised to hear that he was already dead. Summoning the centurion, he asked him if Jesus had already died. When he learned from the centurion that it was so, he gave the body to Joseph. So Joseph bought some linen cloth [sindoni], took down the body, wrapped it in the linen [sindona], and placed it in a tomb cut out of rock. Then he rolled a stone against the entrance of the tomb." Lk 23:50-54 "Now there was a man named Joseph, a member of the Council, a good and upright man, who had not consented to their decision and action. He came from the Judean town of Arimathea and he was waiting for the kingdom of God. Going to Pilate, he asked for Jesus' body. Then he took it down, wrapped it in linen cloth [sindona] and placed it in a tomb cut in the rock, one in which no one had yet been laid." Jn 19:38-41 "Later, Joseph of Arimathea asked Pilate for the body of Jesus. Now Joseph was a disciple of Jesus, but secretly because he feared the Jews. With Pilate's permission, he came and took the body away. He was accompanied by Nicodemus, the man who earlier had visited Jesus at night. Nicodemus brought a mixture of myrrh and aloes, about seventy-five pounds. Taking Jesus' body, the two of them wrapped it [Gk. edesan = root deo "to bind"] , with the spices, in strips of linen [Gk. othoniois = "piece of linen"]. This was in accordance with Jewish burial customs. At the place where Jesus was crucified, there was a garden, and in the garden a new tomb, in which no one had ever been laid. " Lk 24:11-12 "But they did not believe the women, because their words seemed to them like nonsense. Peter, however, got up and ran to the tomb. Bending over, he saw the strips of linen [othoniois] lying by themselves, and he went away, wondering to himself what had happened." Jn 20:3-8 "So Peter and the other disciple [John] started for the tomb. Both were running, but the other disciple outran Peter and reached the tomb first. He bent over and looked in at the strips of linen [othonia] lying there but did not go in. Then Simon Peter, who was behind him, arrived and went into the tomb. He saw the strips of linen [othonia] lying there, as well as the burial cloth [Gk. soudarion = "head cloth"] that had been around Jesus' head. The cloth was folded up [Gk. entetuligmenon = root entulisso "to wrap up, roll up"] by itself, separate from the linen. [this last "from the linen" is not in the Greek] Finally the other disciple, who had reached the tomb first, also went inside. He saw and believed." And note especially that "Luke ... had no difficulty in using the plural (24:12 [othoniois = "strips of linen "]) to describe what he earlier referred to in the singular (23:53 [sindona = "linen cloth"])". So Swank's simplistic argument that, "Twice the word `cloths' is used - plural cloths, not one cloth," is fallacious. Quite clearly the same graveclothes are being referred to both collectively and singly, depending on each writer's focus. As for two pieces of fabric used for a corpse, check out the Gospel of John, chapter 11, verse 44 regarding Lazarus. When Jesus called forth the name of Lazarus, the man came from his tomb, wobbling, dressed in gravecloths. They were plural, not singular. The Bible gives us detail in regard to the fabric: "And he that was dead came forth, bound hand and foot with graveclothes [Gk. keiriais = "bandages"]; and his face was bound about with a napkin. [soudarioo]" (King James Version). Again, "gravecloths" - plural cloths. Not one full piece for the corpse. Again, "napkin" for the head, separate from the full-length fabric. Again Swank's illogic in assuming that "plural" excludes "singular"! And as can be seen by my interpolations above, the Greek word translated "graveclothes" is an entirely different one from sindon, the focus being on the strips of linen binding Lazarus' hands, feet and jaw, not on the shroud he was presumably wearing, otherwise he would have been naked! A. All of the other scriptural issues were dealt with heavily in Verdict. The answers to these apparent discrepancies are as follows: First, the Gospels use the following words to describe the Shroud: Sindon burial sheet, winding sheet, shroud; sudarion-sweat cloth, face cloth, handkerchief; othonia linens. One way for the synoptic Gospels (Matthew, Mark, and Luke) to be in harmony with John is if a burial method like the one depicted on the Shroud was used. John mentions a cloth that was described as `around his head' and about the face of Lazarus (John 20:7; 11:44). The word is sudarion, used in burial to bind the jaw against the effects of rigor mortis. There is evidence on the Shroud that a sudarion was used, though the whereabouts of any such cloth has long been unknown. The Shroud is a pure linen garment with some evidence that the head, hands, and feet were bound, most likely with other `linens.' The synoptics describe a linen sheet-a single cloth. Most likely, the sheet was more significant to the synoptic writers than other funerary cloths. Since the Jewish burial custom allowed the use of cloths to bind the hands and feet as well as the jaw, the total picture matches Jewish burial customs exactly and explains clearly why the synoptics only mention a sindon and John mentions othonia. Two dead bodies - both wrapped about with two separate pieces of fabric. 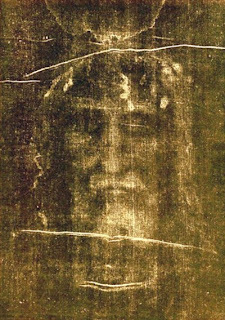 The Shroud of Turin is one full piece that wrapped a corpse of some era; but it can't be the cloth used for the dead frame of Jesus. The Bible relates otherwise. The problem is not "The Bible" but Swank's: 1) lack of consideration of all the evidence in all four gospels; 2) lack of checking the original Greek words; and 3) lack of logic - that there are "two separate pieces of fabric" (i.e. strips of linen that bound a Jewish corpse's hand, feet and jaw) does not exclude that there was also "one full piece" (i.e. a large sheet that then covered the whole body) - and in assuming that when a writer describes a scene, he has to record everything rather than only the most significant things. Exodus 32:15-16. 15Moses turned and went down the mountain with the two tablets of the Testimony in his hands. They were inscribed on both sides, front and back. 16The tablets were the work of God; the writing was the writing of God, engraved on the tablets. I'm not sure if you are familiar with the Sudarium of Oviedo. This answers the question about the other burial cloth of Jesus. It is not as well known as the Shroud, but is another piece of evidence in its support. >I'm not sure if you are familiar with the Sudarium of Oviedo. This answers the question about the other burial cloth of Jesus. It is not as well known as the Shroud, but is another piece of evidence in its support. Thanks for the reminder and the link to Janice Bennett's book, "Sacred Blood, Sacred Image: The Sudarium of Oviedo, New Evidence for the Authenticity of the Shroud of Turin (2001), which I had only just read about in my research on the Sudarium, following your commment. I have now ordered Bennett's book. but they had slipped my immediate focus. The last two articles I have myself just posted to the Web. I also have books which cover the evidence for the Sudarium of Oviedo, e.g. Wilson, I. & Schwortz, B., "The Turin Shroud: The Illustrated Evidence" (2000) and Whiting, B., "The Shroud Story" (2006). As the above articles and the books I have point out, the Sudarium has a continuous documented history going back to the 8th century, so if its botanical material and bloodstains match those on the Shroud (which the they appear to do - although I understand there are problems getting a good DNA match), then that alone would defeat the 1988 radiocarbon 13th century dating of the Shroud. However, even if the Sudarium turns out not to match the Shroud, the above radiocarbon date has been since discredited anyway (as I will show in my next "Bogus: Shroud of Turin? #2). I may quote from the above articles and/or books in my part #2 post on the Shroud or in a separate future post, perhaps a part #3. I am also making inquiries about buying Mark Guscin's book, "The Oviedo Cloth" (1998).